A method to expand γδ T cells from peripheral blood mononuclear cells (PBMC) is described. PBMC-derived γδ T cells are stimulated and expanded using zoledronate and interleukin-2 (IL-2). Large scale expansion of γδ T cells can be applied to autologous cellular immunotherapy of cancer. Kondo, M., Izumi, T., Fujieda, N., Kondo, A., Morishita, T., Matsushita, H., Kakimi, K. Expansion of Human Peripheral Blood γδ T Cells using Zoledronate. J. Vis. Exp. (55), e3182, doi:10.3791/3182 (2011). Draw blood (7.5-8.0 ml) into a BD Vacutainer CPT Cell Preparation Tube with Sodium Heparin. The tube contains a sodium heparin anticoagulant and a Ficoll-Hypaque density fluid, plus a polyester gel barrier, which separates the two liquids. Centrifuge tube/blood sample at room temperature (18°C to 25°C) in a horizontal rotor (swing-out head) for 20 min at 1800 x g. Switch centrifuge brakes off. After centrifugation, the sequence of layers occurs as follows (seen from top to bottom): a) plasma - b) peripheral blood mononuclear cells (PBMC) and platelets - c) density solution - d) polyester gel - e) granulocytes - f) red blood cells (Fig. 1). Collect a fraction of the plasma layer, leaving 5 to 10 mm of plasma above the interphase without disturbing the cell layer. The plasma can be used for the culture (section 2.5). Harvest the enriched fraction (PBMC) at the interphase with a pipette and transfer to a 15 ml conical tube. Wash the PBMC with 10 ml of phosphate-buffered saline (PBS), by inverting the tube 5 times, and then centrifuge for 5 min at 400 x g.
Repeat washing steps twice, and then resuspend the cell pellet in 5 ml of PBS. Determine the cell number. Usually 1.3 x106 cells are recovered from 1 ml of whole blood. Determine the frequency and phenotype of γδ T cells in PBMC by flow cytometry (section 3) (Fig. 2). Centrifuge cell suspensions in 15 ml conical tubes for 5 min at 400 x g at room temperature, and discard the supernatants. Prepare culture medium (CM) by adding human IL-2 (IL-2) and zoledronate (Zometa) to final concentrations of 1000 IU/ml and 5 μM, respectively. ALyS203 (Cell Science & Technology Institute) or OpTmizer (Invitrogen) media support good expansion of γδ T cells (more information in references 6 and 9). Zometa is provided in liquid form (4 mg/5-ml vial). To prepare a 5 μM solution, add 50 μl of Zometa to 30 ml of culture medium. Resuspend cell pellet in culture medium and adjust to 1x106 cells/ml. Pipet 1 ml of CM containing 1x106 cells into each well of a 24-well plate. For large-scale cultures, cells can be seeded at 0.5 x 106 cells/cm2 according to the surface areas of plate wells, dish, or flask. Add autologous plasma (section 1.3), pooled human AB sera, or FCS so that it is approximately 10% of the volume of the culture (100 μl for each well of a 24-well plate). Place the plates in a humidified 37°C, 5% CO2 incubator for 24-48 hr. Maintain the culture at a cell density of 0.5-2 x 106 cells/ml. Add fresh medium containing human IL-2 (1000 IU/ml) only (without Zometa) every 2-3 days, and transfer cultured cells into new wells or flasks as necessary, according to the degree of cell proliferation (Fig. 3). Supply plasma or serum to the medium so that the serum concentration can be maintained at least 1%. Harvest cells on day 12-14 and determine the frequency, phenotype, and functions of γδ T cells by flow cytometry (see below). Transfer 200 μl samples containing 2 x 105 cells to fluorescence-activated cell sorting (FACS) tubes. Add 2 ml of cold PBS and centrifuge for 5 min at 400 x g. Then, resuspend the pellets in 50 μl FACS buffer (PBS + 1% FCS + 0.1% sodium azide). Add 5 μl of each antibodies to the samples (the monoclonal antibodies are listed in Table 1). Incubate on ice in the dark for 20 min. Add 2 ml FACS buffer to each sample, and then vortex. Centrifuge samples for 5 min at 400 x g at 4°C. Carefully decant the supernatant. Resuspend the cells in 300 μl FACS buffer and vortex. Analyze samples on a flow cytometer (Fig. 2). The day before assay, prepare stimulator cells by culturing 3-5 x105 Daudi cells/ml in RPMI 1640 medium plus 10% FCS (RPMI-10) overnight with Zometa (5 μM) (hereafter designated Z-Daudi). Collect Z-Daudi and resuspend in RPMI-10 at 2x106 cells/ml. Add 100 μl of Z-Daudi (2x105) to each well of a round-bottom 96-well plate. Prepare γδ T cells at 2x106 cells/ml in RPMI-10 containing Brefeldin A at 20 μg/ml. Transfer 100 μl of γδ T cell suspension (2x105) to each well containing Z-Daudi cells or to control wells (100 μl of RPMI-10 only, or RPMI-10 with 20 ng/ml of phorbol 12-myristate 13-acetate [PMA] plus 2 μg/ml of ionomycin). Mix by pipetting up and down several times. Incubate for 4 hr in a 37°C, 5% CO2 incubator. Centrifuge the plate for 5 min at 400 x g at 4°C and resuspend the pellets in 200 μl of cold PBS. Transfer the samples to FACS tubes. Add 4 ml of cold PBS and centrifuge the tubes for 5 min at 400 x g at 4°C. Resuspend the pellets in 50 μl of FACS buffer with FITC-conjugated anti-TCRVγ9 (5 μl) and PE/Cy5-conjugated anti-CD3 mAb (2.5 μl). Incubate protected from light for 15 min at room temperature. Add 100 μl of IntraPrep reagent 1 and incubate for 15 min at room temperature. Add 4 ml of PBS to each tube and centrifuge for 5 min at 400 x g at room temperature. Remove the supernatant by aspiration and add 100 μl of IntraPrep reagent 2. Incubate for 5 min at room temperature without shaking. Add 5 μl of PE-conjugated anti-IFN-γ mAb to the test tube. Incubate protected from light for 15 min at room temperature. Add 4 ml of PBS to each tube and centrifuge for 5 min at 400 x g at room temperature. Remove the supernatant by aspiration and resuspend the cell pellet in 0.5 ml of FACS buffer. Analyze the cells by flow cytometer. Gate on CD3+ TCRVγ9+ cells and examine the expression of IFN-γ (Fig. 4). It is important to determine the percentage of γδ T cells in PBMC at the initiation of culture. As shown in Fig. 2 A, the percentage of CD3+TCRVγ9+ γδ T cells in PBMC was 1.6% on day 0. The dominant populations were CD27+CD45RA+ naive or CD27+CD45RA- central memory phenotypes. When γδ T cells were efficiently stimulated, they formed clusters on days 3-5 (Fig. 3 A and B). When cluster formation was delayed, the growth of other cell types, such as CD4+ or CD8+ αβ T cells or NK cells could dominate the growth of γδ T cells (Fig. 3 C and D). After 14 days of culture, the frequency of γδ T cells increased to more than 93.8% of the cultured cells in successful γδ T cell cultures (Fig. 2 E). 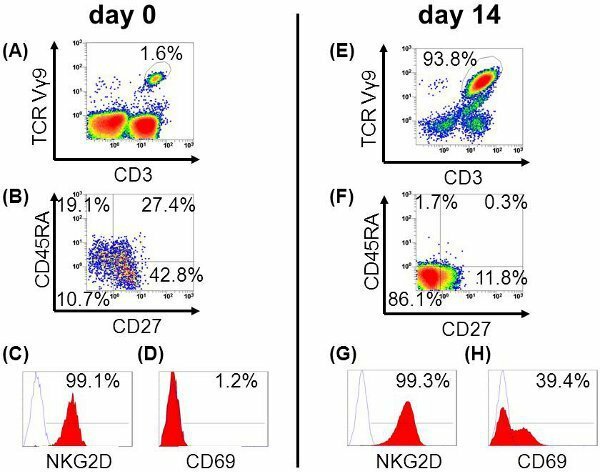 The cultured γδ T cells upregulated NKG2D and CD69 expression (Fig. 2 G and H). They displayed CD27-CD45RA- effector memory phenotype (Fig. 2 F). The functions of γδ T cells were evaluated with regard to cytokine production and cytotoxicity. The intracellular IFN-γ staining demonstrated that γδ T cells produced IFN-γ in response to PMA/ionomycin treatment or Z-Daudi cells that accumulated IPP after zoledronate treatment (Fig. 4). These results indicate that zoledronate can efficiently stimulate and expand functional γδ T cells. Table 1. Monoclonal antibodies used in multicolor staining of γδ T cells. An example of the phenotypic analysis of γδ T cells performed in our laboratory is shown in Fig. 2. Figure 1. Separation of PBMC. 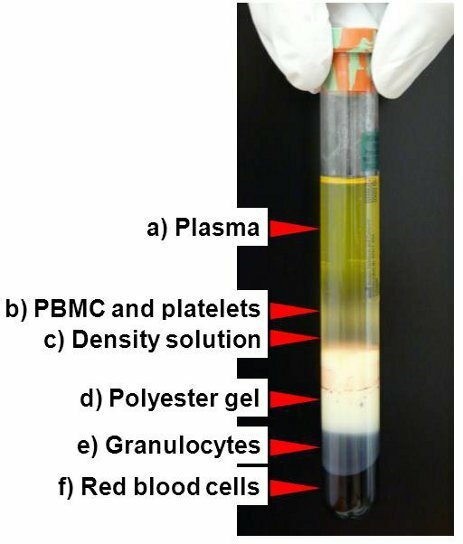 Blood (7.5-8.0 ml) is drawn into a BD Vacutainer CPT Cell Preparation Tube with Sodium Heparin and directly centrifuged for 20 min at 1800 x g. After centrifugation, the resulting layers as seen from top to bottom: a) Plasma - b) PBMC and platelets - c) Density solution - d) Polyester gel - e) Granulocytes - f) Red blood cells. Figure 2. Typical surface phenotype of γδ T cells. PBMC were stimulated with zoledronate and IL-2 for 14 days. Cells were stained with FITC-labeled anti-TCR Vγ9 and PE/Cy5-labeled anti-CD3 to monitor the expansion of γδ T cells (A and E). γδ T cells were identified by their expression of TCRVγ9, and their expression of CD27 and CD45RA (B and F), NKG2D (C and G), or CD69 (D and H) was examined. Figure 3. Representative γδ T cell cultures. PBMC were stimulated with IL-2 (1000 IU/ml) and zoledronate (5 μM). Representative fields are shown (IX71 inverted microscope [Olympus] x 200). Clusters and aggregates of γδ T cells can be observed on day 3 (A) and day 5 (B), when γδ T cells were successfully expanded. In contrast, no clusters or aggregates were observed when γδ T cell growth was not adequate (C and D). Figure 4. IFN-γ production. γδ T cells were incubated with RPMI-10 only (A) or PMA/ionomycin (B) or Z-Daudi (C) for 4 hr. First, surface expression of TCRVγ9 was stained and then IFN-γ production was examined by intracellular IFN-γ staining. Figure 5. Kinetics of γδ T cell culture. (A) Absolute number of cultured cells, (B) percentage of γδ T cells, and (C) absolute number of γδ T cells at the indicated time points. The method presented here enables efficient expansion of γδ T cells from PBMC. γδ T cells activated and expanded by zoledronate and IL-2 develop complete effector functions, reflected by cytokine production and cytotoxicity. It has been reported that the synthetic phosphoantigens bromohydrin pyrophosphate (BrHPP) and 2-methyl-3-butenyl-1-pyrophosphate (2M3B1PP) also expand γδ T cells; however, they are not commercially available. In contrast, zoledronate is already licensed for clinical applications as Zometa. Therefore, a reliable reagent is easily available. The selection of culture media and serum is critical. 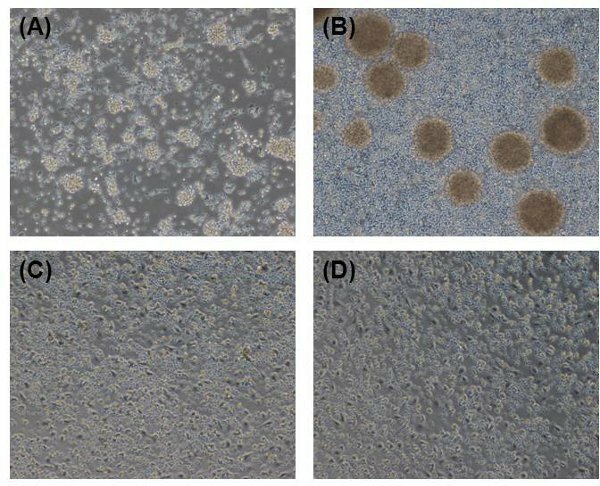 Use appropriate culture media such as ALyS203 (Cell Science & Technology Institute) or OpTmizer (Invitrogen) for successful γδ T cell expansion.11 Verify that autologous plasma, pooled human AB sera or FCS can support γδ T cell culture. Also remember that PBMC from some donors fail to respond to zoledronate stimulation regardless of other culture reagents. If that happens, the only option is to change the donor. Bonneville, M., O'Brien, R. L., Born, W. K. γ T cell effector functions: a blend of innate programming and acquired plasticity. Nat Rev Immunol. 10, 467-478 (2010). Hintz, M. Identification of (E)-4-hydroxy-3-methyl-but-2-enyl pyrophosphate as a major activator for human γδ T cells in Escherichia coli. FEBS Lett. 509, 317-322 (2001). Gober, H. J. Human T cell receptor γδ cells recognize endogenous mevalonate metabolites in tumor cells. J Exp Med. 197, 163-168 (2003). Kabelitz, D., Wesch, D., He, W. Perspectives of gammadelta T cells in tumor immunology. Cancer Res. 67, 5-8 (2007). Roelofs, A. J. Peripheral blood monocytes are responsible for gammadelta T cell activation induced by zoledronic acid through accumulation of IPP/DMAPP. Br J Haematol. 144, 245-250 (2009). Dieli, F. Induction of γδ T-lymphocyte effector functions by bisphosphonate zoledronic acid in cancer patients in vivo. Blood. 102, 2310-2311 (2003). Kondo, M. Zoledronate facilitates large-scale ex vivo expansion of functional γδ T cells from cancer patients for use in adoptive immunotherapy. Cytotherapy. 10, 842-856 (2008). Espinosa, E. Chemical synthesis and biological activity of bromohydrin pyrophosphate, a potent stimulator of human γδ T cells. J Biol Chem. 276, 18337-18344 (2001). Kobayashi, H. Safety profile and anti-tumor effects of adoptive immunotherapy using γδ T cells against advanced renal cell carcinoma: a pilot study. Cancer Immunol Immunother. 56, 469-476 (2007). Murali-Krishna, K. Counting antigen-specific CD8 T cells: a reevaluation of bystander activation during viral infection. Immunity. 8, 177-187 (1998). Sato, K. Impact of culture medium on the expansion of T cells for immunotherapy. Cytotherapy. 11, 936-946 (2009). Abe, Y. Clinical and immunological evaluation of zoledronate-activated Vγ9 γδT-cell-based immunotherapy for patients with multiple myeloma. Exp Hematol. 37, 956-968 (2009). Nakajima, J. A phase I study of adoptive immunotherapy for recurrent non-small-cell lung cancer patients with autologous γδ T cells. Eur J Cardiothorac Surg. 37, 1191-1197 (2010).